What happened? It’s March. Which means St. Patrick’s Day. And Easter this year too! I must say, I love the bright colors that we associate with Easter, it means warm weather is *slowly* approaching. Can you tell how much I love winter? If you’ve been reading this blog for any length of time you’ve probably figured this out. And if you’ve read my about page, you’re probably wondering why I live where I do! 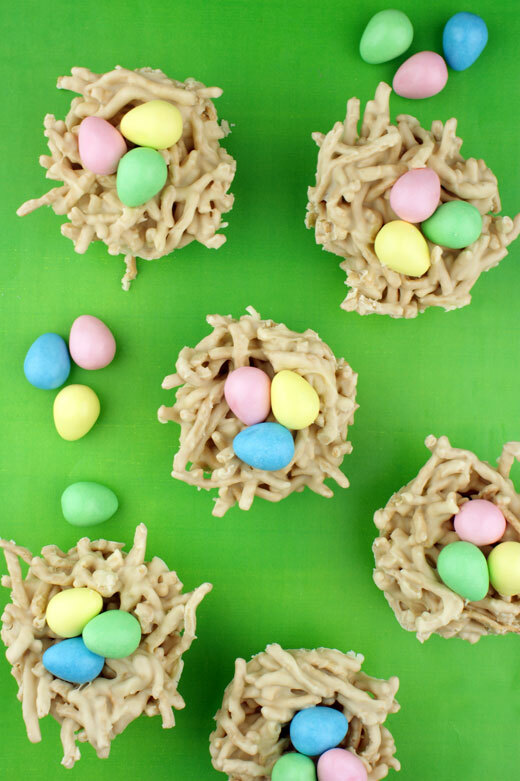 These nests are easy to pull together and you could totally bring the whole family in to help. 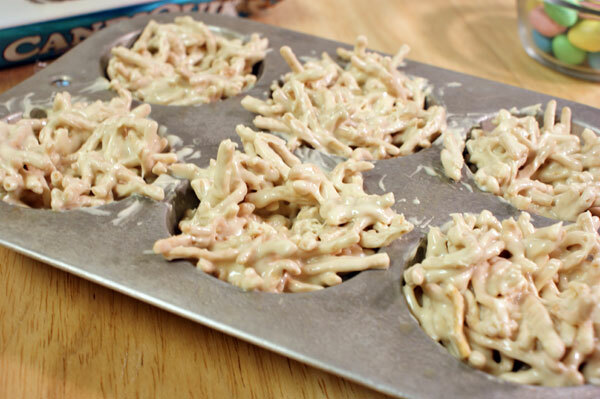 Begin by coating a muffin tin with nonstick spray. Melt your Vanilla CandiQuik in the tray for 1 minute, stir thoroughly and heat for an additional 15 seconds if necessary. Add peanut butter and stir until combined. In a medium mixing bowl, combine chow mein noodles and CandiQuik, stir until chow mein noodles are thoroughly coated. Spoon mixture into the prepared pan, pressing down lightly to compact the nests. 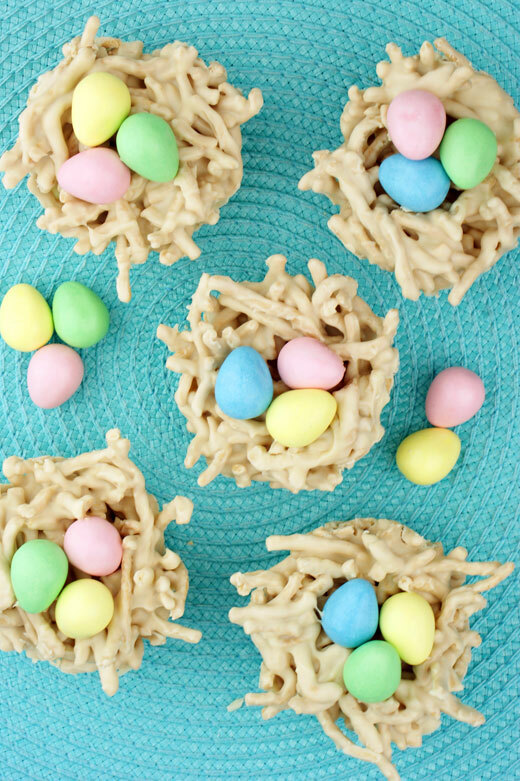 Press egg-shaped candies in the center of the nest. Once the coating was completely set, I inserted a butter knife into one side of the muffin pan and easily popped them out. 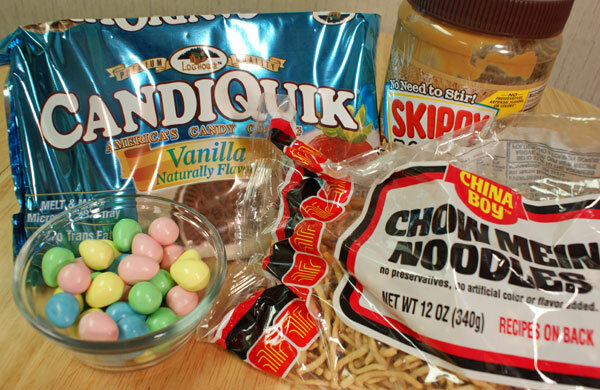 I used Reese’s peanut butter eggs…which were very dangerous to have around by the way. This yielded exactly 6 nests for me, which was the perfect amount. Enjoy! Prepare a muffin pan by coating with nonstick spray. Melt Vanilla CANDIQUIK in tray, according to the directions on the package. Add peanut butter and stir until combined. In a medium mixing bowl, combine chow mein noodles and CANDIQUIK, stir gently until chow mein noodles are thoroughly coated. Spoon mixture into the prepared pan, pressing down lightly to compact the nests. 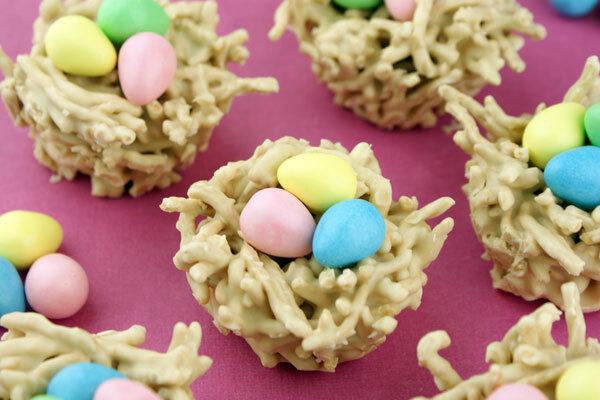 Press egg-shaped candies in the center of the nest. Once set, use a knife to 'pop' the nests out of the pan.